Pet Sitters Australia Carers have lots of hands on experience and knowledge in dealing with pets, all PSA Carers are pet owners of many years standing plus all of our Carers also receive full PSA Carer training. This ensures that they are well equipped to appropriately look after your precious family pet. It may interest you to know that the co-founders of PSA Kerry and Grant have also worked as volunteers in animal rescue circles for years - due to our passion for excellence in pet care and also wanting to work together with other carers, we made a decision to create a supportive and strong network of carers, which would broaden our range of pet care services and carer support, including professional training and insurance coverage for all. At Pet Sitters Australia, we offer a wide range of professional pet care services that is based on what we want and expect from pet carers ourselves. We pride ourselves on our customer service, and treat you, your pets and your home with respect. Kerry grew up immersed in a family that adored and cared for all of their pets as true members of the family, with a full run of the house and equal access to their hearts! Their home was always full of well cared for, well adjusted pets, with up to 4 cats, a dog, and a bird or two at any time. Being able to manage multiple pets’ needs nutritionally and emotionally in such an environment becomes second nature. Kerry has been active for many years in pet rescue circles in Sydney and anyone can be assured that their pets’ welfare will be the top priority when in her care. Kerry loves animals, beasties and critters of all types. She has been known to rescue them all at one time or another – she has a good relationship with several vets in the inner west who have worked with her rescues. Kerry has been involved in many pet rescue projects over many years. Kerry started pet minding and house sitting way back in the 80’s, caring for the much loved pets of various colleagues and friends who just knew that their pets would thrive in her care! This pet care and pet sitting business has now become her passion and animals entrusted to her loving car continue to thrive! Kerry has the pleasure of living with her husband and her four indoor cats, Casey, Dusty, Bob and Flash (all rescues) and cares for her other rescues who still need her as well! 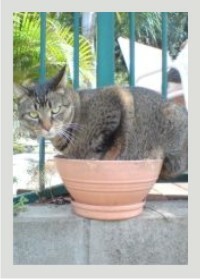 Kerry is a Cert IV TAA (trainer and assessor) and is the course manager and trainer of all Pet Carers for PSA. She has completed Pet First Aid training, and is currently in the process of completing an animal behaviour course. Kerry is a point of reference for any carer questions in relation to pet welfare for all carers. Kerry’s pet sitting and pet care business has now become one that is shared with other animal enthusiasts, as a network of carers, who have all extensive experience in animal care and are trained pet minders. Jenny and Grant (co-founder PSA) have been pet owners all of their lives, sharing their homes with many well loved cats and dogs for over 40 years each. Bother Jenny and Grant have extensive experience in pet minding services starting off as RSPCA emergency carers for dogs in distress. Many dogs with behavioural, nutritional and social issues have been nurtured back to good health and found a new forever home after their loving care. Grant and Jenny not only offer a pet sitting service in your own home, but also have a limited number of spots available for in their home for pet care too. The Desreaux family has hosted many happy ‘away from home’ hounds and quite a few felines over the last 2 years in this industry! They live in leafy Oatley with their daughters and their top cat Morgan and two well balanced dogs Beau and Kelly who are all happy well adjusted animals who regularly welcome new short term dogs and cats into their pack! Simon has had pets all of his teen years and all of his adult life – A period of over 20 years. Simon has many years of experience caring for dogs and cats; they have been and are, without doubt, his furkids! In recent years Simon has also added snakes and lizards into his menagerie and has a great deal of success and pleasure caring for them. He now shares his home with a Chinese Crested dog called Fluffy and lots of lizards and snakes – all healthy and happy and in absolutely fabulous condition! Simon has completed all of the PSA Carer training and is a reference point for reptile care for PSA. Ian and Anita have always loved animals and each grew up with a family that had lots of animals—both the two legged and four legged varieties! - Anita’s family owned a menagerie of pets; from dogs and cats to rabbits, birds, guinea pigs and fish. Their home was full of well-adjusted, loved and nourished animals. Ian has always had dogs to care for and have been a source of great enjoyment and pride. I began pet sitting as a child when she would care for her elderly neighbour’s cats and dogs if they were holidaying or unable to look after them. As a trusted and caring animal lover, Anita’s pet sitting experience naturally expanded over the decades to include regularly house sitting as well as looking after and walking a host of friends’ and relatives’ pets over extended periods. Kimba, our 11 year old male is pictured on the left and Pearl, our 6 year old female is on the right. They are both a testimony to the nutritious diet and exercise program they receive consisting of bones and raw food as well as lots of love and affection. Kimba and Pearl are given lots of interesting daily walks both off and on the leash in Adelaide’s parklands and along its beautiful beaches. This care is extended out to all animals in her care. 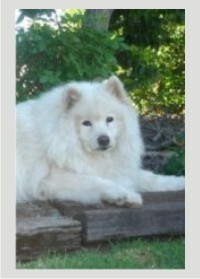 Anita has extensive experience and comes with high levels of training in pet care management. You can be assured your pet will be given the utmost care by a responsible and caring person while you are away. 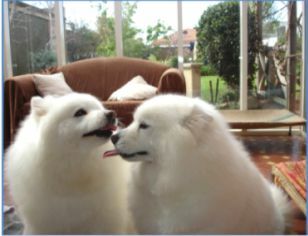 Anita and Ian now work and live in Adelaide with their two Samoyeds.